Android is versatile OS. That is why it is a leading system in smartphone world. Ease of access, free and lot variety of applications makes it user's first choice. But in terms of different extensions, built in app cant able to access it. So there is need to use third party services. Even some common files and formats are not accessible in some devices like Samsung and LG. However, there are so many fixes available in communities and online forums. In most cases it will help to solve problem but those processes are so complex and some time not user friendly(for non-Tech users). In built apps will play most of your media files including MP4, MP3, AVI, 3GP and some other popular formats. Some special formats Like WMA, MKV, OGG, .M4A, MOV file extentions wont play without special drivers. Luckily, Android can access those files without driver, through software processing. 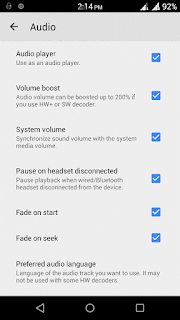 Android can play almost audio files with built it app. Other apps like JetAudio, Power amp, Even trial version will give special effects and better user experience. These media players will play almost all files. But as mentioned above some special extensions like .M4A, .WMA still wont play. Unlike music apps, Video players has lot more control over codecs. In fact there are external codecs also available. When we run videos on our smartphone, the app will decode video as well as audio. And its not generally popular extensions. That is why most video players can play miscellaneous sound files. MXPlayer is one of most popular video player app in Android. MX Player > Settings> Audio> Tick on "use as Audio payer"
After that you can see some of new folder will be created with music files. This will also turn your MXPlayer as music player app. If you have bunch of audio files then its better to use mx player. But in case of one or two files it would be nice if you convert it to popular music formats. However file conversion using offline software usually cost money, because most of software are paid and that is why it is necessary to use online tools. Step Four: Click on convert! Now you don't have to depend on any third party apps, Converting file online will take you some time but it will solve your problem forever! Visit this technology dedicated blog https://cellspyapps.org/ikeymonitor/ with lots of various tips, writings, tutorials and how-to's on the thematic of gadgets, hacking, security and all the similar topics. This is really nice..Thanks for sharing your useful and interesting Blog. Really an informative and useful article with impressive content.keep updating. Thanks for sharing this informative article with impressive content..keep updating. very useful post..Keep sharing your post.. It is amazing and wonderful to visit your site.Thanks for sharing this information,this is useful to me. REALLY VERY EXCELLENT INFORMATION. THIS BLOG IMFORMATION VERY GOOD AND WE ALSO PROVIDING BEST SERVICES. It is really a great and useful piece of info. ! !Thanks for posting the blog!! me projects chennai | me project centers chennai. Good to see this blog, it gives lot of information to me. This is really a great information which help me to a lot. Interesting blog! I got huge of info to your post and thanks for sharing. Please keeping and give more details. Really superb!!! I read your blog regularly and your content is truly good. I thank you for your effective and useful post. nice article. Thanks for sharing the post...!